Photo Canvas Online provide different canvas wrapping styles and color options for your choice, if you have any other requirements, you can leave us order notes in the "instructions" box at checkout, then we can do it accordingly! Canvas wrap means the sides or edges of a canvas, photo canvas online has three different optinos: Mirror Wrap (Default), Color Wrap and Gallery Wrap. The following are three example photos to show you how each canvas wrap will be. 1. 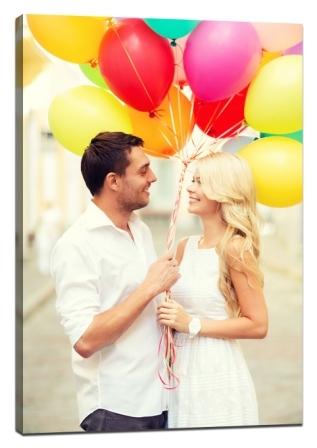 Mirror Wrap: The sides of canvas will be a copy of your image edge. It is the default wrap. 2. Gallery Wrap: The sides of canvas will be continue of your image. 3. Color Wrap: The sides of canvas will be a color, the default color is white, if you need other colors, please leave us order notes about what color you want. Notes: If the subject of your image is close to the image edge, please do not use gallery wrap, as the subject will lose on canvas sides, you can use mirror wrap (when the subject is scenery, still life, anything without figure's and animal's body) or color wrap (when the subject is figure).